This is a story of resistance against all odds, of Cuba’s remarkable recovery from a food crisis brought on by the collapse of trade relations with the former Socialist Bloc and the tightening of the US trade embargo. Unable to import either food or materials needed for conventional agriculture, Cuba turned inward to self-reliance. Sustainable agriculture, organic farming, urban gardens, smaller farms, animal traction, and biological pest control are all part of the new Cuban agriculture. In this book, Cuban authors offer details of these remarkable achievements to serve as guideposts toward healthier, more environmentally friendly and self-reliant farming. Cuba’s remarkable recovery from a food crisis brought on by the collapse of trade relations with the former Socialist Bloc and the tightening of the US trade embargo came about by the use of sustainable agriculture, organic farming, urban gardens, smaller farms, animal traction, and biological pest control. 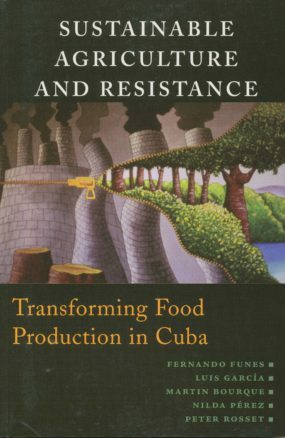 In Sustainable Agriculture and Resistance: Transforming Food Production in Cuba, Cuban authors offer details—for the first time in English—of these remarkable achievements, to serve as guideposts toward healthier, more environmentally friendly and self-reliant farming. Sustainable Agriculture and Resistance: Transforming Food Production in Cuba is the story of Cuba’s achievements in the use sustainable agriculture, organic farming, urban gardens, smaller farms, animal traction, and biological pest control to feed the country.